When talking about human animal hybrids created by the manipulation of DNA I always think of the gods of ancient Egypt. Thoth for example has a head of a bird as shown above. 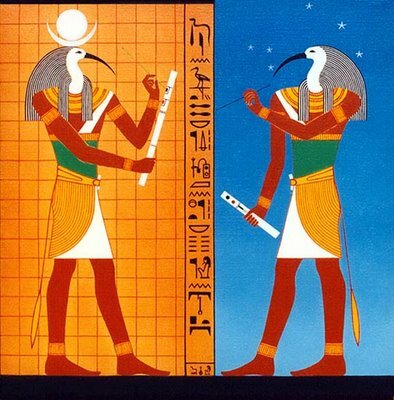 Thoth is the god of wisdom or knowledge and is even tied to Hermes in Greek mythology. Why does he have the head of a bird? I wonder what our ancient ancestors were trying to tell us with this symbolism? Many theories of ancient aliens and the tampering of DNA to make a slave race of humans from chimps is on pretty much every conspiracy website out there. I won't go too much into that with this post. Instead I want to talk about the tampering of animal and human DNA to make a so called 'cure' for our myriad of incurable diseases at the moment. This is the basic premise/excuse scientists are using to actually do these experiments and to create a new form of life that would not exist in any natural form. This is supposedly done purely for the purpose of harvesting stem cells, and noting the results of the 'marriage' of different species with human DNA. This is a scary thing that is going on, and I do have proof that it has been going on in London for the past 3 years. This does not mean however that this is the only place that this is going on. I am sure there are even more hidden agendas, and secret bases working on this very same thing. As of July 2011 scientists have admitted to creating more than 150 human/animal hybrids. For the most part they have been doing this in secret out of the eyes of the public. This in itself is a conspiracy. I also find it weird that the news of all this experimentation comes just a couple of days after scientists warn of a 'Planet of the Apes' like scenario that could actually happen. This is how the movie Rise of The Planet Of the Apes actually starts. I am not entirely convinced that scientists have analysed all possible outcomes for their reckless experiments. All of these experiments started around 2008 with the introduction of the Human Fertilisation Embryology Act. This act basically legalized the creation of all types of hybrids including the fertilization of animal eggs, with human sperm cells. Three labs in the UK were given permission back in 2008 to do these experiments. These labs are located in King's College London, Warwick University, and Newcastle University. You can bet though that these types of experiments are being carried out all over the world in secret, and not all of their purpose revolves around the curing of incurable diseases. I am not saying that all scientists are wrong in this research, but I am saying that we do not fully understand all possible outcomes. This is like a small child playing with a lighter. It is only a matter of time until we all get burned. What do you think? Please let me know in the comments. I think this is just not right or natural. If they want to cure diseases good stick with that but too try to creat some new race is where these scientist are over stepping there bounds. If Jehovah God wanted a hybrid race he would have created it. I don't know how he feels about scientist tryna do this but something tells me it will back fire on them and be worst. Because scientist are humans and can only do so much as the bring a soul to life without Gods hand in on the matter. If they do actually achieve this just how will the outcome be like what would the do then let the hybrid live like a normal being or run countless test on it? Do they want a race a hybrids that might be superior to the human race? I hope not because I wounldnt want me experiment to suddenly take over and terrorize me.